There is one question I do not know how to answer. All’s I’m asking. Thank you. But I’m not so great when the tables are turned. When someone talks about how her child is doing in school and asks me about homeschooling, I can tell them what I did and why, but when it comes to what I think they should do, I struggle. I don’t know. What has worked for me might not work for them. When someone asks about how to care for a sick loved one and starts talking about Hospice options, I can share what I know, but no way can I tell them if it is the right choice or not. If a parent of a high school junior or senior wants to know what I think about his or her daughter going to Wesleyan, I can surefire tell them all that I love about the experience of being a part of the sisterhood there. What do I think they should do–sure, send your daughter there. But the truth of the matter is, I really don’t know what they should do. When my daughter calls and wants to know how she should handle some drama at school, I can make suggestions, but I don’t really know exactly what she should do. I’m not there, and I’m not her. We are all different. like when a friend is thinking about quitting her job and going back to school, but she isn’t sure she can afford to–what do I think she should do? or someone I love is having relationship problems and is considering making a huge life change, what do I think she should do? Oh my, sweet girl, I have no idea. I know how difficult this question of “what should I do” is to answer. And still I ask it of others. What am I asking for when I ask that question? Advice? Wisdom? Or validation for what I already think I should do? I don’t know. Maybe yes, yes, and yes? My heart breaks for the friends who have asked me this very question over the past few days. Not so much because I couldn’t answer but because they are in a place where they felt the need to ask. That place of feeling lost. Of being unsure. Of wobbling on the path they are on. Wondering if another would be any better. And there’s nothing I can do to help. But listen. And love them as I tell them I just don’t know the answer to their questions. I don’t know what they should do. Most of the time I’m not even sure what I should do. Every fiber of my being wants to wrap them in a hug and, to quote from “Hey Jude” which Paul McCartney wrote for Julian Lennon to comfort him during his parents’ divorce, I just want to “take a sad song and make it better.” Always wanting to make it better. Whatever that would look like. Tonight I give thanks that there is something I can do. I can’t fix it, I can’t make it better, I can’t even tell those whom I love what I think they should do. But I can do two little things. I can sit with them in the darkness* and walk alongside them. And I can love them. 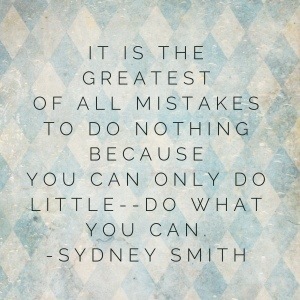 I can definitely do that. I was taught by one of the best. We may not have all of the answers or the magic to make things better for each other, but we do not journey alone. And tonight I am the most grateful for that. There are some things I have no control over in life, and I have become okay with that. That part of me probably came to be a little after 3:32 a.m. on a Tuesday morning in September 1995. With the birth of my first child. You have children, you learn to let some things slide just a tad. Or else life can get really hard. Like my little guy, Cooter, who is now a reader! I don’t know if there is a more melodious sound than the sound of his voice sounding out a word. It’s precious. He doesn’t sound the least bit frustrated either, just determined. And curious. I LOVE THAT SOUND. See, I knew I couldn’t control when he would start reading, though I might possibly have whined and worried about it just a little to my Aunt. Ahem. But here we are. Having met another milestone. Relief. Homeschooling gives me many situations I cannot control. Or perhaps better put–many battles I choose not to fight. Like when Cooter went through his phase of writing his capital H’s and then turning them into modified tic tac toe boards. Bless him. He’d giggle and cut his eyes over at me every time he did it. He is the class clown of Zoo Crew Academy. Cooter’s style of writing H’s when he first started writing. And now that he is reading, he is learning to spell words. 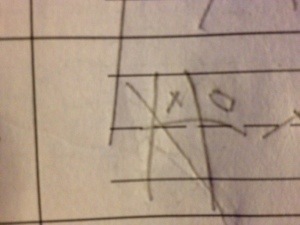 His workbook asks him to spell or choose the correct word based on a simple picture. So this happened recently. Tap. The word is obviously tap. But not for Cooter and his quirky sense of humor. He got so excited and the biggest smile was on his face. He could hardly get the words out through his laughter. “Because she’s about to walk…..into…..a…..TRAP!” Insert little boy maniacal laughter here. This boys cracks me up. And I think he knows it. Later I found this mistake. 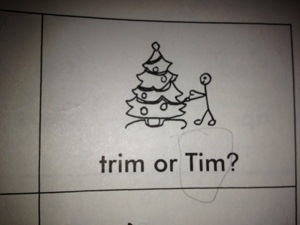 The guy decorating the tree is apparently named Tim, and apparently he and Cooter are on a first name basis. I gave him credit. Seriously, how often do I say, “Hey, let’s trim the tree”? Not very. So Tim it is. And this is just the tip of the iceberg. So I can handle not feeling in control of things. I was not raised getting my own way. As a matter of fact, I’m not so sure that sometimes things didn’t go the other way just to help me learn to adapt. Then there are things I can control. Like the type of toothpaste I purchase. Until I make a mistake and get a different flavor. I just opened the new tube, and blech. A one word difference, I kid you not. Same brand, same type, only thing different is one word in the flavor. Fresh mint versus fresh clean mint. I could cry. It has a hint of licorice flavor to it, and I don’t like licorice. I always gave Daddy my black jelly beans. (He would have loved this toothpaste.) And so now I am stuck. Throw it out, you say? Oh no, I will suffer through it. Waste not, want not. Words I was raised on. And suffering through, well it’s kind of what we do. It was earlier this week that it occurred to me just how frustrating it is not to be in control, not to know what is going on. The morning was getting started good, and I was taking Miss Sophie out for her morning routine. We walked up and down our street, with her searching for the perfect spot and me ready to pull the baggie out of my pocket at any time. Then I heard it. She did too. She looked back toward our backyard. 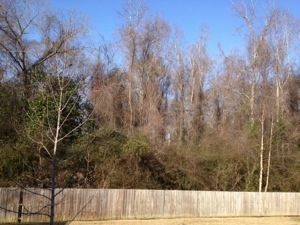 We live at the end of a cul-de-sac with our backyard up against the woods. Behind the woods is a major road. We can hear the traffic sometimes, depending the time of day and the weather. We can hear the train when it goes by. Still it’s a pretty peaceful spot. The birds are happy and perform daily, and it is a delight to hear. But this, this sound? It made my stomach lurch, my shoulders tighten, and my head hurt. Or something like it. I knew it was a possibility, I guess. 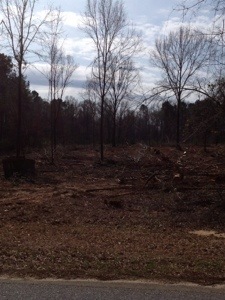 We were told when we moved here that the woods were protected, and that nothing would go in behind us. Funny as it might seem since I’m not a fan of snakes and other such critters, I like being against the woods. It’s peaceful. And it reminds me of my Granny’s woods that Daddy would take us trekking through. But then this has been happening behind many of the houses on the same line as ours. I am not sure how far down they’re coming, but when I heard that sound behind us, I half expected to see those trees toppling before my eyes. They are getting so close to taking down the trees behind us. I’m just not sure how far they’re going to come. So far there’s nothing very noticeable. I think it might be a little thinner back there than normal, but I can’t be sure. I realized then, as I walked Miss Sophie back to our porch and I found myself close to tears, that I don’t handle things I can’t control very well after all. While I can handle tic-tac-toe H’s and the occasional different brand of toilet paper that finds its way into this house (OCD much? yes, thank you), apparently I draw the line at things that affect my peace and my life and my sanctuary. I don’t know how I will cope if the trees back there start falling, and I don’t like not knowing if it’s going to happen. That’s what Mama would have said. She would have pointed out that there is more of life that we can’t control than we can. Actually those words sound so familiar. You know what? She has said those exact words to me. And she’s right. The things we can’t control….. There are a lot of them. For all of us. Bloodwork we wait to hear the results from, spots we watch to see how they develop, papers we try our best on and sit back and wait to be graded, tests we study for and take and try our best, things we write and hope will be well-received, people we love making choices that harm them, doctor’s appointments to diagnose what’s causing leg pain or headaches or stomach problems. We sit back and hold ourselves tight and try not to acknowledge how scary the not knowing, the not being in control really is. If only everything could turn out like the “trap versus tap” situation. Not so serious and keep us laughing. But it doesn’t always, does it? Mama used to quote the Serenity Prayer to me. She learned how to live it. I have heard it so much over the years. It is a core part of the twelve step programs. I’ve heard Mac and Miss P from Sister Circle quote it a lot. My Pirate girl sent this to me unexpectedly last night. While I don’t advocate violence as a general rule, since it’s hypothetical in this case, I let it slide. It came when I most needed a smile and a hug. Love that girl and my whole crew. My phone rang early this morning. I had it set on vibrate but I could hear it echoing in the drawer I had left it charging in overnight. I picked it up. Mac. I breathed a sigh of relief. He usually comes to Daybreak around the time for Sister Circle on Tuesdays to visit and catch up and get (give) a hug and share a fist bump with Cooter. But yesterday he wasn’t around. I asked a few folks, and no one had seen him recently. It was the last pretty day before some lousy weather so I was hoping he was just enjoying it and that everything was okay. Then someone mentioned they’d heard he was in the hospital but they couldn’t remember…..was it two weeks ago? Or two days? It took me a moment to clear my throat and say Good Morning, I was so relieved. He had been working on rain and cold-proofing his camp yesterday, as best as he could. He apologized for missing seeing us. He’d gotten so busy, and when he looked at his watch it was 4 p.m.–almost time for Daybreak to close up for the day. I understood. Time flies. It happens to all of us. He said he was going to hang around the shelter this morning and then walk several blocks over to eat lunch at the soup kitchen at a local church. This is no small feat for him. He struggles to walk even short distances most of the time, as his knees can give out on him. Even sober, he looks wobbly when he walks. As it was rainy and the roads were slick this morning, I asked if maybe there would be a shuttle to take everyone over. He said no, they didn’t have such as that. “I’ll walk. I do it most days anyway,” he said. Turns out he had been in the hospital. On Sunday evening. He was having seizures again. That happens if he doesn’t take his medicine. And without insurance and a regular doctor, he doesn’t have access to taking his medicine regularly. When he started having the seizure one of his friends called 911. An ambulance came and picked him up. Instead of taking him to the downtown hospital or the one just a little ways up the road from where he stays, they took him all the way across town to the hospital on the north side of town. “What?” I asked. “That’s all the way over near Wesleyan.” I cannot imagine what their reason was for that. It can be a twenty minute drive on a good day. “You walked all the way across town back to downtown?” I was blown away. We talked about some resources that could be available to help him get his medicine prescription regularly, so I hope that will get better for him, and that he will be stay on the medicine, warding off future seizures. After everything he’d just told me and he was still singing praises? Okay, I had to hear this. “Wow, Mac, that’s amazing. Were they your size?” Here’s where I am, I’m expecting that they pinch his toes slightly or they flap around a little but they’ll be fine. Oh, ye of little faith sister. My friend was thrilled with his shoes and he trusts that God meant for him to have them, to find them there in that trashcan. After we hung up with his promise to meet me next week, my mind’s eye kept playing back to a moment yesterday. I was driving across the Spring Street bridge before Sister Circle, and I saw Mac’s best friend, JJ. He was walking along the edge of the bridge, carrying a bag from McDonald’s. When I told Mac I’d seen him, he laughed and said he hadn’t seen JJ in a while, and that the bag was probably empty. I asked why and he just laughed it off. I guess that’s a story for another day. As I saw JJ in my memory, my heart asked my head a question I still can’t answer. Why would God give Mac new shoes and leave JJ out hustling for food over near the bridge? Sometimes it just be’s that way. Sometimes someone who needs something happens upon something they need. Sometimes they meet someone willing to help. And sometimes, more times than I care to think about, they don’t. They wind up eating out of the Pizza Hut dumpster out back–“folks throw away a lot of good food, you know”–or they beg for money so they can buy a burger. Or a beer. The burger fills the void in the stomach. The beer makes you forget that void and all of the others. For a while anyway. The thing is that I am glad that Mac thanks God for those shoes. I would not take that away from him for anything in this world. I just don’t know that I can bear to believe that kind of theology in my own life. I wanted to cry. And cry out. Where was that Hand for the person who was killed? Why put a Protective Hand on one and not on the other? God, what is all that about? And again, the only way I can find my way out of that heart-wrenching question and answer and guessing game, is to say, “Sometimes it just be’s that way.” I’m sorry, I just can’t believe that God chose one over the other. Anymore than I can believe that God chooses for one child to be born healthy and another to be born with a life-threatening disease. Or that God chose to take my Daddy, whose healing was prayed for by so many loving friends and strangers, “because He needed him more than I did” and left other people here to live. Or that one dedicated, faithful student could be in a hospital bed fighting for her life but God “protected” the other student who chose partying over studying. I just can’t wrap my brain around theology like that. “Sometimes it just be’s that way” is a lot easier to accept. And for a cold, wet, and rainy Wednesday, that will have to do. When I was in the third grade, Mrs. Turner, one of my very favorite teachers of all time, read aloud “Charlotte’s Web” by E. B. White. It was after lunch. She would turn the lights off and we could put our heads down and listen. I was thankful for that, because when it got to the end, I cried and cried under the cover of my arms. I think it was the first time a book touched me so deeply. Earlier this month we had the privilege of taking the littles to see the very same story at the Grand Opera House in Macon. It was well done, and we all enjoyed it. And yes, I cried. Over so much. Today at Sister Circle we talked about webs. About connectedness. We had a ball of yarn, and we passed it around. What if someone is kind to me, and then I’m kind to you, and you’re kind to the lady in line at the grocery store who goes home and helps her son with his homework instead of fussing at him for not having it done. Each person held on to the string. And with just a few passes of kindness we had a web. And then we did the same thing with grumpiness and anger and hurtful words. Also a web. Just not a good one to be a part of. Everything we do is a part of the web of feelings that get passed around one to another each day. We do not live in a vacuum. Our emotions are not self-contained. They leak out and touch everyone around us and eventually even those who aren’t around us. 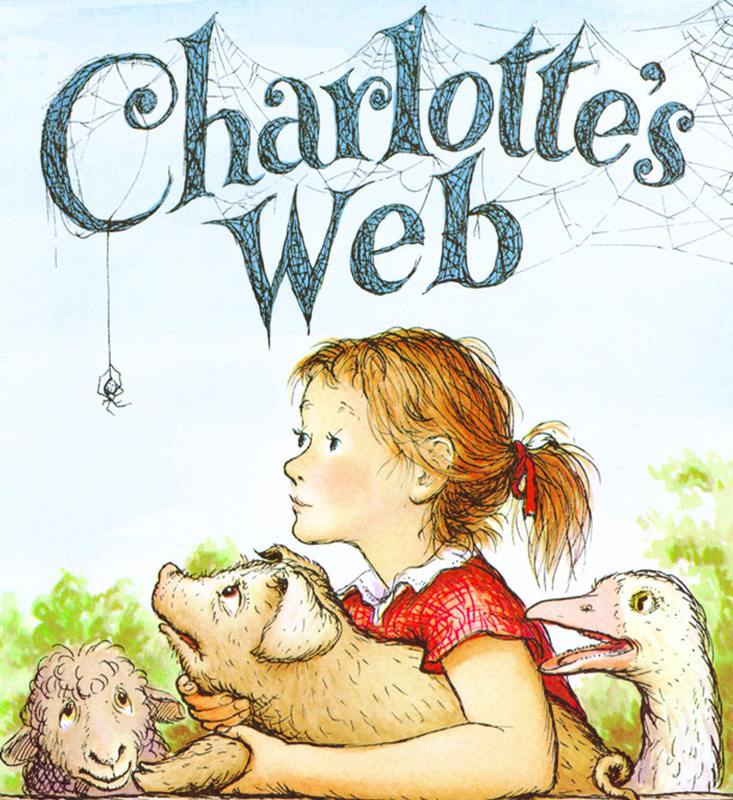 As we talked about webs, the conversation moved to a synopsis of “Charlotte’s Web.” We all had heard the story, but not everyone remembered it well. Miss N said, “I know it’s about a girl…..and a pig.” Yes. Fern. And Wilbur. And then there’s Charlotte. The spider. Who shows up when Wilbur is lonely and really wants a friend. When he is really in need. And then, she announces herself. I remember this scene because it was when I first learned the word “salutations.” What a fabulous word. And then, just as Wilbur was settling down for his morning nap, he heard again the thin voice that had addressed him the night before. Charlotte saves Wilbur’s life by writing words in her web about how fantastic he is. She assures him that the plan will work, saying “Most people will believe almost anything they see in print.” And so she weaves. In the end, Charlotte does save Wilbur’s life with her weaving of beautiful words to describe Wilbur’s character–“Some Pig,” “Radiant,” “Terrific,” and “Humble.” Wilbur is thankful, but he doesn’t understand why Charlotte would do all of this. Beautiful. Words that have stuck with me all these years. The true gift of friendship. All of these and a few more wove their way into our conversation. All traits that we would like others to see in each of us. We also talked about how we can be a “word web weaver” for others. Sharing a smile, a kind word, a hug. “Yeah, ’cause you can’t fake a hug,” said Miss P. Well, ain’t that the truth. I thought about what we shared on the way home this afternoon. About the words being woven by others for us. And I realized that Mama was my Charlotte. She gave and encouraged and loved, asking for nothing in return. I used to talk to Mama on the phone at least twice a day. She never failed to call me out when I was self-disparaging OR misbehaving. But she was the quickest to praise and to remind me I was a gift from God. She could make me believe I was all of those things above, and so very much more. I rarely had to ask her to help me feel better. Somehow she intuited that I needed a lift and she found just the right words. Even when I didn’t want to hear them, when I wanted to wallow for a moment or two longer, she was having none of it. She made me feel irreplaceable and treasured. This morning I woke up tired and knew that didn’t bode well for my day. I’ve been trying to put a finger on why my heart is heavier than usual, and why I am floundering in trying to decide what my “next adventure” should be. Not even. Let’s back up to trying to garner up the energy to even begin thinking about a “next adventure.” And then it hit me this afternoon. As I drove down I-75 on the route to Byron, one I have travelled so many times from the time I was very small, with the sun hitting my windshield just so and the beautiful and haunting, “Say Something” playing on the radio, I realized. I miss my Charlotte. She saved my life on more than one occasion with her words and her wisdom and her letting me and anyone else who would listen know that she thought I was pretty wonderful. Selfish, yes. But I miss her encouragement. And her wrinkled nose smile that said, “I love you.” And her hugs. Miss P was right, there’s no faking those. Over the years I went from reaching up to bending down to hug her, but that didn’t make any one of them any less precious to me. In missing my Mama, I don’t mean to negate the love of my family and friends, and I hope I don’t hurt or offend. Just as Charlotte left hundreds of little eggs-soon-to-be-spiders with Wilbur when she left this world, Mama left me a great gathering of beautiful people who love and support and encourage. But they are not my Charlotte. The one who saw the need even before I realized. The one who cut off any chance of my being hurt that she could prevent. The one who told me to go rest while she took care of me. The one who lived her life loving others with every fiber of her being. Tonight I’m thankful for the time I had my Charlotte in my life. I miss her labels she put on me, and the way she never let me forget whose baby I was and always will be. I know I’m lucky, some folks never have that. I’m thankful for our Sister Circle, where we can share and learn to be Charlottes for each other. Most of all, I’m thankful for the tears. As I heard a physical therapist say today, “Pain is good. It means all the nerves are waking up, and the pain can be dispersed.” One day, maybe, it won’t hurt so much. But today it does. And that’s okay. It has to be. And so today, for a bit, I weep over the loss of Charlotte, just as I did in 1977 in the classroom at the old school down the hall from the auditorium. 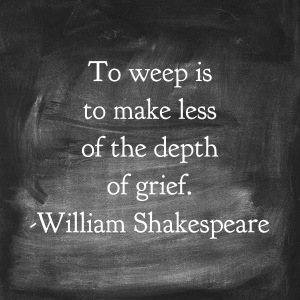 I bury my face and I cry, and one day, Mr. Shakespeare, I hope to find that you speak the truth. Wishing for a Charlotte in each one of your lives. Love to all. Twenty-one years ago, the world lost an amazing…..and an amazed man. He loved life. He was in love with living I think. My Great Uncle, married to my Mama’s Mama’s sister, my dear Great Aunt. I can honestly say he was one of the most joy-filled people I’ve ever met. Family issues put him and my Aunt in a position to be our grandparent figures on Mama’s side of the family. Mama and her brother moved in with them when she was in high school, though they’d already been stable and consistent people in their lives before. Mama loved living with them, and when we came along, we loved them too. Where my Aunt was, for the most part, very ladylike and all about doing what was “proper,” my Uncle was full of fun and laughter. I can remember from a very early age visiting them, and him motioning quietly for me to come over. I’d lean over his recliner where he sat so I could hear his whisper. “Shhh, go ask your Aunt when she’s going to get her hair done.” Like an obedient puppy (is there such a thing?) I’d walk up to my Great Aunt and ask, completely unaware that she had been that morning, “Aunt W, when are you going to have your hair done?” She’d snap her dishtowel at me and click her tongue. “Go on with you. And go tell your Uncle he’s full of trouble, getting you to ask me that.” He would laugh and it was infectious. Before I knew it we’d both be rolling in laughter. That was life with him. Rollicking and fun. He was a CB ham radio operator. He let me call Mama on it one time when I was spending the night with them. From his radio to her phone. And sometimes we’d talk to his Ham radio buddies. They all treated me like I was royalty. I learned to say “over” when I was done speaking. I loved it. He also loved clocks. He had one whole wall in the wood-paneled den covered in clocks. My Uncle was one of the first people I ever met with a computer. He was fascinated by them, and he wanted to know everything. I would often show my cell phone to my Great Aunt in the last couple of years of her life, and say, “Wouldn’t Uncle R love this?” And he would have. A mini-computer? That takes pictures and fits in your pocket and you can talk on it–shut the front door. He would have had the very latest, not to impress anyone, just because he loved technology. He had a dune buggy for a while. That was fun too. And he had a metal detector that he found some of the coolest things with and he let us try it. He and Aunt W loved going to Helen, Georgia to go panning for gold, but their very favorite place on earth? Oh my. They went several times. I know they really loved Epcot too. But Mickey Mouse was a favorite. They had matching timepieces with Mickey Mouse on the face. So full of joy and whimsy and love of life. But he was no fly by the seat of his pants kind of guy. He retired from Robins Air Force Base as a civil servant and worked in a doctor’s office in the later years. He was a great cook and love my Aunt dearly. He raised Mama and her brother and loved them like they were his own. Just as he loved us. When I graduated from high school, he and Aunt W drove up from their small town south of here in time to come to the house first for a visit before the ceremony. A couple of my friends from school were coming over to help me type my speech. They arrived and said they’d seen a couple stopped just up the road from our dirt road, putting something on their car. We all were puzzled, but shrugged and went on. The mystery was solved a few minutes later when my Great Aunt and Uncle pulled into our yard. There were cardboard signs stuck all over their Very. Nice. Car. “Follow us to Graduation.” “Tara is Tops.” “Tara is “MY” niece.” The last two lines he had also had printed on fancy plastic name badges they wore to graduation. Very swanky. I was laughing and crying at the same time. I was so loved. When I married, they were listed in the announcement as my maternal grandparents. That’s who they had always been. It was cold and rainy on a Sunday afternoon in February 1993. I went by my Granny’s after church to visit for a few minutes. I was heading to Macon to see my Great Uncle who had been pre-admitted to the Medical Center for surgery on an aneurysm near his heart. Granny was worried about the weather, but I assured her I would be okay. I drove up and spent a wonderful afternoon–laughing of course. My Uncle was full of stories and they always made us laugh. It was with a reluctant heart that I said goodbye to the party that included him, my Great Aunt, and my Mama. At the time I remember I wish I could have stayed longer, but I told him I’d see him again in a day or two after the surgery. The surgery was scheduled for Monday, and as far as I remember it went okay. But Tuesday morning, very early, brought me the phone call I will never forget. It was my Daddy’s voice. “Tara, I need to tell you something.” That was never good. My Great Uncle died in the wee hours of that Tuesday morning. Mama drove my Aunt in the dark hours before dawn back to her home over an hour away. I drove Daddy up to the hospital to get Mama’s car, and then I followed him down to my Aunt’s house. We spent the day making coffee for folks who dropped by–in small towns news travels fast. That was where I got my “making coffee for other folks” phobia. One lady made a face and nearly spat her coffee out. “Who made this coffee?” she asked. “It’s horrible.” I wanted to tell her I did, and she was welcome to make it herself. In her own home. But I didn’t. 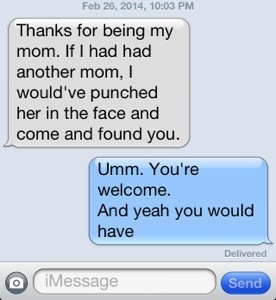 That wouldn’t have been proper and neither my Aunt nor my Mama would have been pleased. Still. During the ride with Daddy and then the ride down south by myself, my mind kept turning. It had happened so quickly. I had had no worries over this surgery. What had happened? I was so glad for the gift of that Sunday. I treasure the memory of that visit still. But as I thought about it then, my hands gripped the steering wheel tightly, and I asked myself a question that I still wonder about from time to time now. If I had known it was our last visit, how much longer would I have stayed? Would I have been able to leave at all? This is where my mind goes when folks start talking about wanting to know the future. Not me. It would just be too hard to LIVE if I did. My Great-Granddaddy, Aunt W’s Daddy, used to give me a dollar to spend at the TG&Y on occasion. One time he gave me one and my Uncle took me to the store. I bought a little Tweety Bird. My Uncle was delighted. He spent the rest of my visit “fussing” about that bird and all the mess he was making. I would find him in the trashcan sometimes. I can remember hearing a toilet flush, and then my Uncle walked in the den, wiping his hands, and said, “Well we won’t be bothered by that bird anymore!” Once I figured out the game, I was all in. I made sure I took Tweety Bird every time we went. Somehow over the seventeen years after Uncle R passed, Tweety Bird became my thing with my Great Aunt. Our way of continuing the laughter and remembering. I found everything from Tweety Bird socks and hand towels to sheets and tea seats and shirts. Well, what else do you give a prim and proper lady from south Georgia? Tonight I am thankful for a man who loved my Mama through some dark times as though she were his, and then who loved me and all of us like we were the greatest treasures he’d ever found. He, in fact, was the treasure. He brought laughter and joy and whimsy into our lives and chased the darkness in the corners away. He was patient with our questions and curiosity and instead of telling us “don’t touch,” he seemed to love showing us new things on each visit, as though he’d been saving it up just for us. As for that question I have wondered about all these years, I’m glad I didn’t know what was going to happen when I sat in the hospital room that Sunday afternoon. If I had, the visit would have been a lot different. Instead it was nearly as fun as if we’d been sitting in his den back home, listening to another tale from Mama’s childhood or the story of his new favorite attraction at Disney. It was a visit filled with hope and fun and a love of life and others, just as his whole life was. And for that, I give thanks. I know because today I did. I went back to the place I loved when I was growing up. Wesleyan College. When my Mama was in school there, finishing a degree that I had unintentionally and in utero interrupted, I visited and fell in love with it. Mama spent two years in classes there to change majors and finish a degree she had only been two quarters shy of twelve years earlier. She took us to campus when we were out of school and she had classes. I sat in the solid wood desks in Taylor Hall and wrote stories while she learned Psychology. I had no clue that six years later I’d be sitting in those same desks, fascinated by the same course of study Mama loved. She and Daddy took us to plays and concerts and performances by the Naiads (the synchronized swimmers) on a regular basis. It already felt like home before I set foot on the campus in fall of ’86 as a full-fledged Wesleyanne. And so it has ever since. My four years there gave me memories and friends I’ll treasure forever. I married there twelve years after graduation. Right there around the same fountain I was thrown in on my birthday every year. ‘Cause that’s what we do–throw you in the fountain on your birthday and when you get engaged. It’s called love, people. And tradition. And about that. The tradition continues. Aub began her Wesleyan journey officially on August 17, 2013. What an amazing journey hers has been. Despite a hard semester emotionally, she did well academically. She too has made friends whom she will love forever. And she made another tradition a huge part of her life. The Pirate STUNT committee–y’all did a great job! In a nutshell, each class elects a committee who writes and directs their class’ thirty minute comedy-musical. Aub was elected to be on her class, the Pirates, committee. 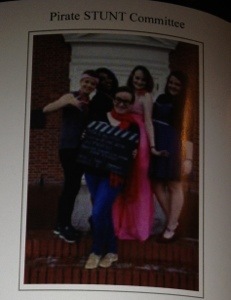 Since last fall, she and four other wonderful women from her class wrote and edited and dreamed and spent many hours creating their class STUNT. 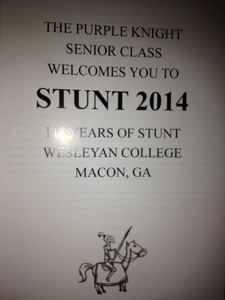 Three weeks ago they read the STUNT to their class for the very first time. Yes, it’s been kept a secret that long. And until three nights ago, the other classes had no clue what the other STUNTS were about. It all culminated in tonight. STUNT night. The big competition for the STUNT cup. Ticket sales from the event raise money for scholarships for rising seniors. This is the 118th year. That’s a lot of helping out your sister. And I was one of the beneficiaries many moons ago. Thankful. 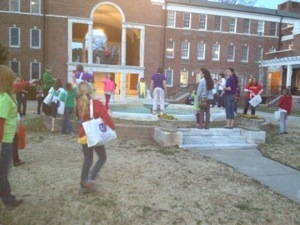 Today was also Welcome to Wesleyan Weekend. The day Wesleyannes bring young women–daughters, nieces, friends–to campus to attend mock classes, listen to the story of STUNT, eat in the dining hall, see dorm rooms, and attend STUNT. I took our Princess, my Golden Heart 2027. She has been so excited about this for weeks. She planned her outfit–jeans and her Golden Heart Wesleyan shirt that her big sister got her last fall. And a red sweater to support Aub’s class, the Pirates, in their effort to win the STUNT cup. A precious day full of more moments to treasure. Being with women whom I lived with for four years. Before we entered the “Real World.” I had promised to giggle the first time one of us had to use her “Mama” voice. And I did. But then I was the second–it was inevitable with my crew. 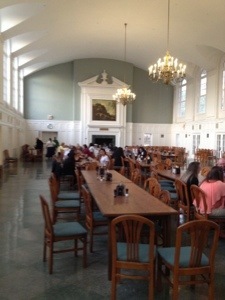 I sat in the dining hall and ate supper with friends I’ve known for a long, long time. Almost thirty years–what?! How did that even happen? And I had a wonderful visit with someone whom I had seen in plays there before my freshman year who became a dear friend. I adored her then and I still do. She’s just that fabulous. One of the women from the class ahead of us led us in the singing of the Doxology. I don’t think I will ever hear the beauty of voices raised in song in this room and not get chills. Every. Single. Time. Funny thing is we only ever sang it on Thursday nights before Family Style Supper, and yet, when I went to sit down tonight, it was the first thing I remembered from my years there in that beautiful room. Our children played together around the fountain, and we reminisced. So much to remember, so much forgotten, but one thing stood out. Sisterhood. It does last a lifetime. Heading to the fountain for our Pep rally. It is, baby girl, it is. And so another Wesleyanne is born. I love this place and the things that never change. Familiar. That is home for me. 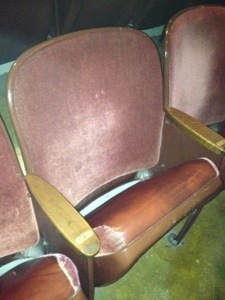 While sitting in Porter Auditorium tonight watching the classes put on an awesome show, I moved in my seat. Without thinking, I reached down and felt the velvety sides to the leather seat. I knew without consciously remembering that’s how they were made. I’ve sat and touched the velvet during plays, concerts, convocations, meetings, STUNT rehearsals (so many of those), Alumnae meetings, and graduations. It’s like going in a house you haven’t been in for years and you just KNOW where everything is. Because it’s home. Tonight I give thanks for folks who have known me forever it seems. For the ones who listen to old stories and new, for the laughter–oh thank you for the laughter, for little girls and big ones bonding together where their Mamas learned to begin growing up. For memories rising up and causing your heart to skip a beat because they are so vivid. For the whispered words of my roommate when I was climbing over a chair, “I’ve got you,” and the realization that yes, she always has. I’m thankful that my girl gets to create her own memories in the same place where her Mama and Maemae did so many years ago. I’m thankful that I left her tonight with a smile on her face and joy in her heart. Her class didn’t win the coveted STUNT cup, but they won something much better–a bonding experience and story after story that I hope one day they will share together on a sunny afternoon sitting around the fountain remembering with those they grew to love. I’m also thankful for all who have supported her journey. Godparents and Aunts and family and friends who were sitting in the audience, cheering my Pirate on, I love and appreciate more than they can know. For folks who wore red or sent her encouraging words, it meant so much. And to my Wesleyan sisters who sat and watched and cheered for a class different from their own (and even brought her cookies), simply because she was mine and therefore theirs, my heart is full to bustin’. Tonight I’ll be dreaming sweet dreams of home. Love to all.